The Eco Warriors sub-set hasn’t generally been regarded as one of the Real American Hero line’s shining moments. Part of the ever increasing trend toward splintering the GI Joe concept into action feature filled offshoots and more socially conscious action toys, the set remained only for one year beyond its debut. Of all the detours of the time, I found the Eco Warrior villains to be the most interesting, at least from a toy perspective. The Cobras are distinctive, bold and colorful. Their leader, Cesspool, makes for an impressive addition to the higher powers within Cobra. Does this guy well represent the excesses of the 80s corporate world, or what? His outfit is ostentatious, even by Cobra standards. He’s sporting almost as much gold and snake accents as Serpentor himself. Impressive. It’s sorely missed in his modern interpretation. Cesspool has one of the more frustratingly small accessories from the RAH era’s later years. The tiny breather attached to his helmet is removable, and all of the loose samples I’ve gotten in lots over the years have been missing this essential piece. It’s an piece integral to the look of his helmet. If you don’t have it, the poor guy is stuck with a gaping hole in the front of his helmet. Finally, I Wish I had me one o’ them acid assisted chainsaws. Would do wonders for annual spring cleanup in the backyard. I had his accessories before I even got the whole figure a few years later. Man, I’m still looking for the breather piece too–I’m surprised there hasn’t been any repros made of that! Cesspool is easily the best Eco-Warriors figure in my opinion and one of my all-time favorite Joe figures. I didn’t really like his portrayal in either the cartoon or the comics. I just thought he had so much potential. The face sculpt is cool, and the card art completely brings it to life for me. Also i made a custom Cesspool. His head is RO.C.CC. I didnt need to paint it. I just tore off the thin plastic mask. I recall my Cesspool’s helmet piece being glued in. Maybe because he came after years of drought for new named Cobra villains (most 1988-1990 enemy characters were Dreadnoks or Iron Grenadiers) but I thought Cesspool was a worthwhile addition to Cobra. For one he wears a shirt…with sleeves even, and despite with the evil polluter theme, his character doesn’t look limited to that role. It’s not like say, Croc Master, where you take the guy out of the swamp and try to have him lead an urban assault or send Raptor on a mission to the arctic, both of which would seem comically out of place. Your writeup about Cesspool is perfect. EcoWarriors may be laughable now, but it was a sign of the times then (like DEF). The DIC cartoon’s rapid rise-and-fall of Cesspool makes him forgettable. But look at that figure; he’s a supervillain just waiting to be unleashed. And acid-tipped chainsaw ranks up there with nunchuka axe (Buzzer) – more dangerous to the user than the intended victim! Epic face sculpt for the time! 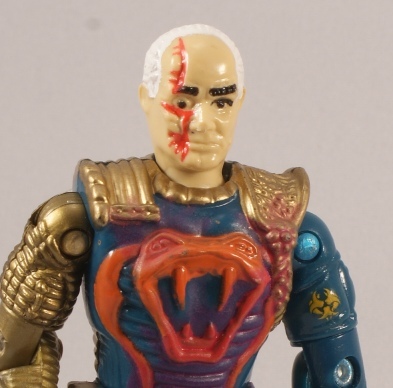 It seems later on, GI Joe had few new Cobra personalities. Overlord & Cesspool are the last. Gristle had no presence. There was Metal-Head, but he started out as Destro’s Scrap-Iron. The figure does have more detail in his design than Overlord, though Overlord, despite being more plain had as strong a presence or identity. I actually liked the Eco-Warriors’ motif and gimmick (which would be water spraying) though as an adult, Cobra or a company having their end be pollution rather than a byproduct of their means just seems absurd. I wonder if the chainsaw + disfigured face was a reference to something. The bulging eye brings to mind Toxic Avenger. Well, if there was a snowy owl version of Raptor (with a feather/fur suit), then he might be suitable for an arctic mission. Oh Cesspool. There are no words for how much I truly love you. This is a great figure. I’m not saying that out of any sense of irony; I genuinely mean it. He has a fantastic design, full of amazing ideas and a brilliant execution. The head scuplt alone is fantastic, with the twisted scar and mismatching eyes. It’s full of personality and presence, and begs ofr more use. But it’s just the start; that chestpiece with the moulded Cobra logo, the eapulets, the arm shield (or whatever it is), the little computer-thing on his leg… they’re all great, and come together nicely. The colours actually work together to make him over the top without being stupidly such. Oh, and you have to love his helmet and that chainsaw. Cesspool is one of my favouritest Joe figures of all time. He’s a true classic, one that deserves batter then it gets. he should be one of the great Cobra villains of all time based on that figure alone, and I think he doesn’t deserve to languish in obscurity just because of his connection to the Eco-Warriors concept. it’s a pity that his characterization in both the DiC cartoon and the Marvel RAH comic amounted to him being a one-dimensional goony clod who was evil for the sake of it. Devils’ Due gave him some depth and motivation postumously, but that was about it. And, of course, IDW killed him off because he’s from after 1987 and this doesn’t matter. I used Cesspool quite a bit, being a named Cobra, and fairly tough and crazy looking. I bought Cesspool back in the day when Children’s Palace was clearing out everything. By the time I got there, the more deluxe-priced figures such as Eco-Warriors were the bulk of what was left. The helmet reminded me of a Viper helmet quite a bit, and when I got Cesspool his breathing piece was fairly snug in place. I often wondered if it wasn’t glued, and then when it did fall out, I was digging in my accessory box like mad. Cesspool is pretty cool, I mean, who else had a comic cover with ‘Joes about to get dipped in acid to end up like the others in the vat? A villain through and through, one I should have kept. Originally named by Hasbro as “Oil Baron”, and Hama told them that name didn’t fit the character. The moniker “Cesspool” is limiting, though. Hard to take a guy calling himself trashy seriously as a leader. Cesspool, you are awesome, as a character and a toy. Love the scar, love the uniform, love the sculpt, love the metal arm. 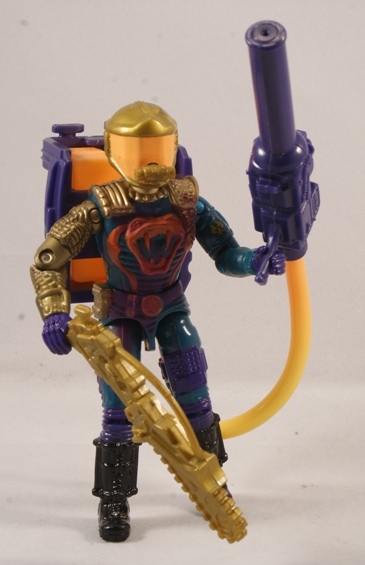 If only I’d picked him when I saw him on the pegs decades ago…instead, I bought the Toxo-Viper, because I loved to collect Viper troops, and that may have been the last ARAH Joe I ever bought off the pegs. But in many ways, Cesspool is the last of what was great about Cobra. As a kid, Any Named Cobra character was a “boss” character, like in a video game. And this guy rightly deserved the title. He leads my Toxo Vipers, Toxo Zombies and anyone else I can lump in the the Hazmat category. To me he was always in charge of making battlefields even more hazardous for the joes and their vehicles.